There are several reasons dogs start chewing on their paws, such as allergies, dry skin, and nail problems. If you think the behavior is compulsive, it’s a good idea to consult a veterinarian. Allergies is one of the most common reasons for chewing and licking on paws. Just like people, dogs can be allergic to all sorts of things. Food ingredients and pollen are common culprits, but there may be many other things. Dry winter weather or a generally dry climate can dry out your dog’s skin. Many dogs try to soothe dry skin through licking, scratching, and chewing. A diet low in fatty acids can also dry out the skin and paws. Some dogs chew their paws because of anxiety or depression. It can be separation anxiety or not having enough to do. 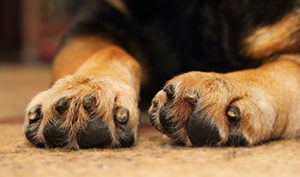 Other reasons may be an injury, and it’s a good idea to check your dog’s paws regularly. Pests such as fleas or mites can also incite chewing.